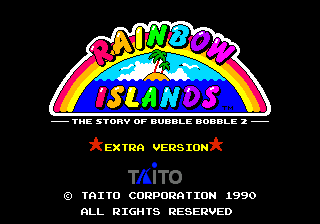 Rainbow Islands Extra (レインボーアイランド エキストラ) is an update version of Rainbow Islands: The Story of Bubble Bobble 2, extra version was released by Taito for arcades in 1988. It was ported to the Sega Mega Drive in 1990 exclusively in Japan. Bubby's friends have been captured and turned into Bubble Dragons by Super Skull Monsta [sic], and Bubby needs to save them by destroying the Super Skull Monsta's minions with rainbows and collecting Little Diamonds to get Magical Mirrors needed to break the spell. Original and "Extra" version are selectable in option menu. The rules are otherwise the same - create rainbows to defeat enemies and reach the top of the screen. The order of characters and music are interchanged in two versions. and moves, makes rainbows and jumps. Extra version enemies Darius island. Main article: Rainbow Islands Extra/Magazine articles. Main article: Rainbow Islands Extra/Promotional material.